Pikaplant produces designer furniture and homewares that make plantkeeping super easy. We ship to 100+ retailers in 11 countries with pre-sales in 46 countries. At Pikaplant we believe greener living is better living. We invent and produce designer furniture and homewares with a unique focus: our products make plantkeeping so easy that anyone can do it. We are currently shipping products to over 100 retailers in 11 countries, and we have pre-sold our products in 46 countries. Now we're scaling up, and we expect that by 2019 your investment will have grown in value by 500% to 800%. Urban gardening, green cities, COP21; green living is a megatrend. It's growing and it's here to stay. People across the world love plants. The problem is that it can be hard to keep them alive indoors. We're busy, we go on holidays, we forget to water them, or we water them too much. The global market for designer furniture is valued at €22bn and projected to grow at least 4% per year until 2020 (Bain&Co/Technavio). Our market is where easy green and designer furniture come together. Pikaplant is currently shipping two products: Jar (Best of Dutch Design Week 2014) and One (Best of Milan Design Week 2015). We plan to start shipping our third product Tableau (Best of Kickstarter) in December. Pikaplant aims to be the greenest design label in the world, and we will grow our collection of beautifully designed easy plantkeeping products for many years to come. Demand is growing fast, and we're ready to scale up production and distribution. This year we are raising €400k by offering a mix of equity and debt, €100k of which through Symbid. €60k will finance the development and production of a critical stock of Jars shippable by third party distributors. This unlocks two new client segments: international distributors and web shops. With your investment we plan to implement this in August 2016. €35k will finance the development, production, and intellectual property protection for a part of Tableau. Pikaplant aims to become the greenest design label in the world, producing a range of beautifully designed easy plantkeeping products. We are creating lasting value in design patents, technology patents, and in the brand's worldwide distribution network and client base. Assuming the company develops along the projected path, we expect that by 2019 the value of your shares will increase by 500% to 800%. In every profitable year we will pay out dividends of 7%, as long as we're solvent enough. We plan on starting as early as 2017. So far we have identified the following possible exit strategies: owner buy-back, merger with another design label, and acquisition by an investment fund. If you believe in green living, if you like our products, and if you want to make plantkeeping easy, join us. Become one of the first owners of Pikaplant, the green design label. Daniel is particularly interested design for sustainability, and building a global brand. He has a Master of Science degree in Strategic Product Design and he's specialised in branding and new product marketing. He ran Pikaplant's Kickstarter campaign in 2015, and he has collaborated with Joost on consumer innovations since 2007. Their full-time partnership started in 2009. Joost is a lifelong inventor. He has a Master of Science degree in Integrated Product Design and he is specialised in engineering and product management. His technical capabilities are the backbone of Pikaplant technology. CTO of a tech startup until 2009, he has collaborated with Daniel on innovative consumer products since 2007. Their full-time partnership started in 2009. Javier loves designing green products. He was trained as a product designer at Elisava in Barcelona, recently earning a Master of Design degree. He divides his time between developing Pikaplant products, photography, teaching the team Spanish, and laying down sick drum beats. Always welcoming and always smiling, Renee is the main contact for many of Pikaplant's clients and suppliers. The ultimate multitasker, she somehow fits planning, account management, after-sales, external communications, and an extreme fitness regime into her work week. Jess is a traveller of the world and international foodie extraordinaire. With a fresh bachelor degree in marketing to her name, she is learning the communications ropes with Pikaplant. She loves design, she loves plants, and she spends her time talking the good talk on social media. Carmel recently earned a bachelor degree in illustration and animation at Kingston University. She's honing her crafts by contributing on all things design-related at Pikaplant, whether it's new products, visual content, or packaging. A nature-lover and avid jogger, she regularly hits the parks in Amsterdam. Driving slowly and carefully is Gijs's specialty. He has delivered Pikaplant products to over 40 European cities, including Oslo, Gothenburg, Copenhagen, Berlin, Paris, Cannes, and Toulouse, always stopping to let the elderly cross the road. Still on his wish list are Munich, Barcelona, Madrid, and Milan. People love plants across the world, but it can be hard to keep them alive indoors. Our research suggests that self-perceived watering incompetence is the #1 reason for people not to keep plants. Pikaplant is currently shipping two products that automatically water your plants: Jar and One. We plan to start shipping Tableau, our third product, in December. 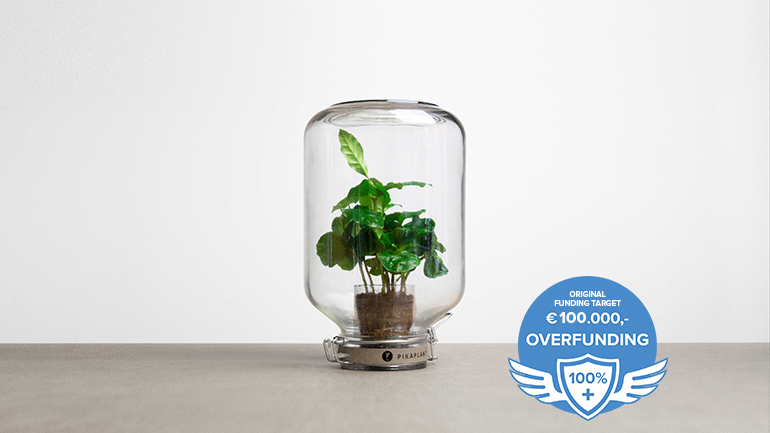 Jar (€50-€80) is a plant you never need to water. It lives in an airtight biotope, recycling the water and air it has inside. It waters itself, so you don't need to. Jar was named Best of Dutch Design Week by The Creators Project and Het Parool, and it is our star product. It ships with the plant included. One (€3000) is a shelving system with ebb-and-flow irrigation technology. It automatically and wirelessly waters your herbs and houseplants. It has ebb-and-flow irrigation technology, working for an estimated 80% of indoor plants. Named Best of Milan Design Week 2015 by Yatzer, One is our flagship product. It ships without plants included. Tableau (€280) is a tray that waters three herbs or houseplants using similar ebb-and-flow technology to One. We expect to ship this product in December. We've pre-sold 700+ units in 46 countries; 12% of pre-sales were to friends and family. Named Best of Kickstarter by Booooooom!, we expect Tableau to be at least as popular as Jar. It ships without plants included. With Jar as the star product, Pikaplant has claimed a solid position in the Benelux market. We have started shipping to international retailers in 11 countries, and pre-sales of Tableau are in 46 countries. Demand for our products is growing fast, and it's global. The largest potential is in Europe, USA, Asia Pacific, and the Middle East. We estimate that worldwide there are 12.3k suitably matched retailers and 300 web shops. We have identified suitable distributors and web shops in Germany, Austria, Switzerland, USA, China, Korea, and Japan. They have strong retailer networks in designer furniture and homewares and they have expressed interest in purchasing our products in bulk. Our production space is large enough to fulfil container-sized orders, and the distributors and web shops are keen to order. As soon as we complete development of shippable Jar, our operation is completely scalable. We expect to launch shippable Jar in August. Over 5,000 products have been shipped to retailers, consumers, and corporates. To unlock sales to distributors and web shops, we are upgrading Jar so that it's shippable by third parties. Shippable Jar is currently in the pilot phase, with tests running in several countries. Tableau development is also in full swing, and we've identified key technology patents to apply for. We plan on extending our product range, growing our collection of beautifully designed easy plantkeeping products. We will also be exploring variations of Jar and Tableau at different price points in the future. Urban gardening, green cities, COP21; people have a deep psychological need to connect with nature. Green living is a megatrend; it’s growing and it’s here to stay. Our consumer target group consists of design-savvy plant-lovers. We're engaging 25-44 year-olds in particular (67% of 80k+ website visitors). 53% are male, and 47% are female. Our business target groups are furniture and homewares retailers, web shops, international distributors, and interior architects. The global market for designer furniture is valued at €22bn and projected to grow at least 4% per year until 2020 (Bain&Co/Technavio). The main growth drivers are consumer sales through web shops and retailers. There are an estimated 12,300 suitably matched retailers worldwide, 300 web shops, and 1,200 interior architects. It's a fragmented market, with many players large and small. For example Haworth (€1bn+ annual turnover) produces and distributes for multiple brands like Cassina and Capellini. Labels like Herman Miller (€1bn+), B&B Italia (€160m+), Vitra, Menu, Mooooi and Serax produce for multiple individual designers. Ikea isn’t included in the €22bn market valuation, but has a remarkably successful monobrand model. With an annual turnover of €30bn+, Ikea is about to launch a range of home gardening products. Our products compete on design value, ease-of-use, and in the case of Jar, on price. Jar competes with other terrariums on design value, ease-of-use, and price. Artisinal designers and makers of terrariums abound in the major global cities. Terrariums the same size as Jar sell for €150, and terrariums twice the size sell for €350, 6 times the price of a Jar. Examples include Spruitje (NL), London Terrariums (UK), and Green Factory (FR). Tableau competes with other innovative planter products on design value and functionality. It's easier to use and has a more refined aesthetic than generic self watering products for potted plants (Nutley's). These sell from €20-€80 excluding pots. Tableau works to automatically water a wider range of plants than other innovative plant-related products, as well as offering more design value. Other products are priced at around the €70 price point (Click&Grow, Boskke, Elho) up to €250 (Plantui). Since we launched in 2014 we have shipped to 110+ retailers. We currently ship to 100+ retailers in 11 countries, including Hutspot (NL), Restored (NL), Rewind (BE), Juttu (BE), Fleux'(FR), Hallesches Haus (DE), Monologue (UK), and Artilleriet (SE). We have shipped over 5,000 units of Jar and 20 units of One, and we have pre-sold over 700 units of Tableau to consumers in 46 countries. 12% of pre-sales were to friends and family. Sales grew 30% month-on-month in Q1 2016. The feedback we have received from our retail clients has been overwhelmingly positive, which shows in our 90% retention since we launched in 2014. Consumers are also positive, providing evidence that our products are great conversation starters. This applies to situations at work, at home, at a birthday, or at a housewarming party. Demand is growing fast, and sales grew 30% month-on-month in Q1 2016. This year our target is to reach 281 points-of-sale, while adding 16 web shops to the client mix. We aim to ship 18.9k units in 2016, to retailers, web shops, and international distributors. A distributor buys from us in bulk and sells to their network of retailers, so one deal will lead to potentially hundreds of points-of-sale. The first steps reach these targets are to develop and produce a shippable Jar, and to finalise development and production of Tableau. These projections were made based on our 2015 sales data, together with a selection of our retailer clients. Pikaplant is the greenest design label in the Netherlands. Our designer furniture and homewares are beautifully designed, and they make plantkeeping so easy that anyone can do it. One and Tableau automatically water 80% of commercially available herbs and houseplants. Jar is a great gift product, a plant you never need to water. The plant lives in an airtight biotope, recycling the water and air it has inside. It waters itself, so you don't need to. In 2016, like 2015, we’re running an inkblot marketing strategy to spread organically across Europe. We direct-sell our products to influential shops, show at design trade shows, and raise awareness online. Jar is often given as a gift, bringing a virality to the mix. Tastemaking shops are the innovators, typically the first placements we have in a new market. They are frequently visited by tastemaking consumers and buyers from other shops. Placement here is also a good stepping stone to free publicity, as the press often visit to see what’s new. Design trade shows are generally either commercial or public. Commercial trade shows are visited by retailers, distributors, and agents, and we sign a lot of new clients here. Public shows are visited by a mix of buyers, consumers and press, and are good for free publicity and brand awareness. This year we plan to show at Milan Design Week, Paris Design Week, London Design Festival, and Dutch Design Week. Online events are where we engage most consumers. Online is where people spend over 30% of their time. Through our online promotions we’re able to engage with thousands of interested consumers. To date we have welcomed 80k+ visitors to our website. We've also attracted 3.6k+ Facebook fans, 2.1k+ Instagram followers, and 500+ backers on Kickstarter. Gifting virality is a great multiplier for our marketing efforts. Jar is often given as a gift, and this spreads awareness. When you receive a gift this is more often than not in a group setting, and the giver tells a story about the gift. The group then knows about our product, and our brand. Direct sales efforts generate leads and we deal with new clients directly through phone, email, and store visits. We are also working with a sales agent for the Belgian market. Our marketing activities are focused on brand awareness, product placement, and generating sales to new clients. These activities are year-round and ongoing. Key partnerships have been established with sales agents, production facilities, and suppliers. This year we will build partnerships with IP lawyers and international distributors. To date we have generated revenues exceeding €250,000. The market for designer furniture and homewares will continue to grow at least 4% per year until end-of-year 2018, with consumer-focused retailers and web shops as the main growth drivers. The total potential global market for Jar (and subsequent variations in size, shape, and plant species) is 3m units. Also, we expect the demand for Jar and subsequent variations to continue to grow until the end of 2018, at which point we will have shipped 240k+ units, or 8% of the total market potential. The total market potential of One is 100k units, and 4.3m units for Tableau (and subsequent variations in size, shape, and materials). Revenues from Tableau and subsequent variations will overtake Jar revenues in Q4 2018, and by end-of-year 2018 we will have sold 39k+ units, or 1% of the total market potential. By end-of-year 2018 we will be operating with 1000+ points-of-sale (8% of the total number of designer furniture and homewares retailers), and 70+ web shops (23% of the current number of designer furniture and homewares web shops). The founders have invested a cumulative 7,000 hours to invent, design, develop, produce, and sell the Pikaplant products. They bootstrapped the company, investing €14k in 2014, and grew it into what it is today. We plan to raise a total of €400k this year, offering a mix of debt and equity. We are raising €100k here on Symbid, offering a 3% equity stake to the investment cooperative. The key investments to make are developing and producing a critical stock of shippable Jar, and finalising development of Tableau. The first €60k will finance shippable Jar, unlocking two new target groups: international distributors and web shops. €35k completes the development and tooling budget of Tableau, and €105k will finance a critical stock of this product. €100k will subsequently finance the first 6 months of a USA or Asia Pacific subsidiary. We are creating lasting value in design patents, technology patents, and in the brand's worldwide distribution network and client base. Earn dividends. In profitable years we will pay out 7% dividends (provided that we maintain a solvency of at least 30%) and we plan on starting as early as 2017. Following the projected path we expect that by 2019 the value of your investment will have increased by 500% to 800%. So far we've identified owner buy-back, merger with another label, and acquisition by an investment fund as possible exit strategies. Owner buy-back. We expect that by 2019 we will have sufficient liquidity to buy back shares from early investors. Merger with another label. There are many examples of past mergers and acquisitions in the industry. For example Haworth owns Capellini, Cassina, and Poltrona Frau. Moooi was bought by Lensvelt and B&B Italia in 2006, and the founders recently bought back all shares. Acquisition by an investment fund. The global market for designer furniture is both stable and growing. Several investment funds are investing in designer labels. 3D Investments owns a stake in Serax. Investindustrial is a €1bn fund that owns large stakes in Flos and B&B Italia, as well as Aston Martin. Price pressure from larger players. By maintaining the high design and production quality of our products, our clients will continue to pay premium prices. Also, we are selective in which retailers to involve in our network, mitigating the risk of price pressure. Copycats. When a product is successful, there is always a risk of copycat products. In order to mitigate this risk we are protecting our intellectual property through technology and design patents. We are also committed to continuously improve our products, staying a step ahead of copycats. Also we are working with production facilities that are located within Europe for key assemblies. Supply chain agility and resilience. We have established partnerships with local suppliers to keep critical stock throughout the supply chain. We work with large suppliers to maintain long term health of our supply chain. Managing talent and skills. The management team has experience leading teams of up to ten people. We believe in continuous learning, and as the team scales we will take organisation courses to educate ourselves about managing larger teams. We are also starting an employee ownership fund to foster a culture of creativity and results, and to incentivise talent to join, and the best employees to stay long-term.